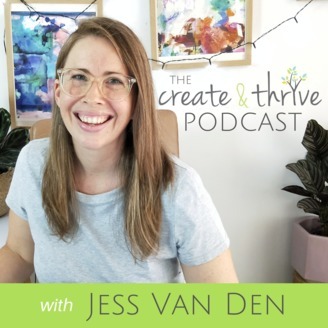 Learn how to turn your creative hobby into a thriving business with Jess Van Den. 4th Anniversary Q&A – I answer your handmade business questions. 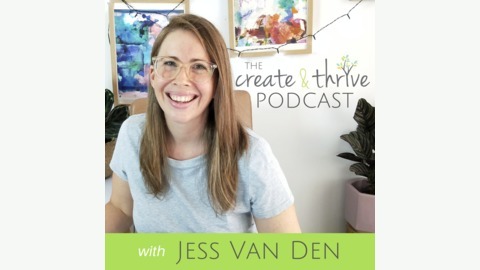 To celebrate the 4th anniversary of the start of The Create & Thrive Podcast, I’m answering YOUR handmade business questions in this episode. I got a ton of great, meaty questions – and I answered a number of them in this episode. If I didn’t answer yours, never fear! I do plan on doing a follow-up episode answering more questions in a future episode. Huge thanks to everyone who sent in a question – I loved this opportunity to help you out directly. You can make a secure donation (of the amount of your choice) via the Paypal button below. Each donation helps cover the cost of hosting, show-note writing, research, interviewing, recording, editing, etc. etc. In short – it helps to cover the time and financial costs of putting together a free weekly show to help you grow your handmade business. Leave a review on the C&T FB page. Join the Thriver Circle – without the members of the Circle, this podcast would not be possible. You’ll also get access to an extra members-only episode every month. I mentioned this episode of the Creative Introvert Podcast in the show. For The Business of Making Podcast on overcoming imposter syndrome, click here. Grab my freemium – the Etsy Quick-Start Guide right here.